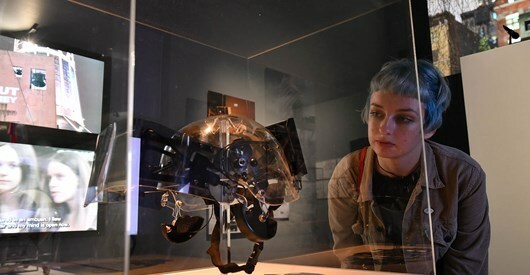 The Helmet Project, displayed as part of Liverpool Biennial 2016 at FACT, was based on the effects of conflict- but not strictly confined to the military context. 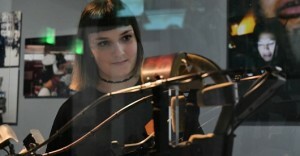 The group were initially introduced to the project by artist Krzysztof Wodiczko, who previously ran a short, related project with the group aimed at fostering a better understanding of the impact of combat on veterans and their families. For this project, Wodiczko introduced a ‘helmet’ concept and initial prototype, which the group have developed in a series of workshops. Throughout the workshops each veteran identified their own, often contrasting, motivations for being involved in the project. This meant that different themes emerged as to the purpose of the end product and user experience. 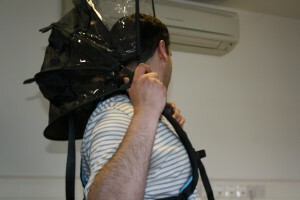 The initial prototype was mainly designed with the idea of ‘protection’ in mind, driven by a need to feel protected from ‘triggering’ experiences during the everyday experience of life. By providing a screen in front of the face, the user can be cut off from potentially triggering experiences, for example, when walking down the street. A projector is also incorporated into the helmet, to allow the user to project images to provide a comforting counter-image to a potentially ‘triggering’ one.